Until a few months ago, I had never owned or used an upright cleaner. I had always had the cylinder type as had my mother before me. Now vacuum cleaners are not the sort of thing you replace every year but with so many new designs with lots of different features, I decided to go shopping. I didn’t go with a particular make and model in mind. What I was after however, was a cordless machine. I wanted to be able to get it from out of ‘under stairs’ easily so that I could clean when the house was grubby rather than wait for the once a week clean through. Feet don’t pick and chose when to bring dirt in I’ve found and as for spillages, well with the husband I have, they are a fairly regular occurrence. Not having a name on my list, I was a salesman’s dream. The only thing they had to provide was that it was cordless. There was only one chap around the vacuum cleaner department and he worked for VAX. Now, my knowledge of this company was even less than my knowledge of Hoover, Electrolux, Dyson. The only thing I knew about VAX was that they had ‘wet’ machines which had always seemed a strange concept to me! The machine was demonstrated and passed my criteria (that is the criteria I didn’t realize I had until I started to talk about cleaning!) The one thing that really surprised me was that it was an upright cleaner and I was perfectly happy with it. If you’d asked me before entering the store if I would be buying this style I would have been vehement in my ‘Definitely not!’. However, that was what we bought. I love my upright cleaner and have never ‘hoovered’ round so much in years. I have had back problems for years and vacuuming was one task that really made it hurt with a cylinder model but I had never put two and two together. 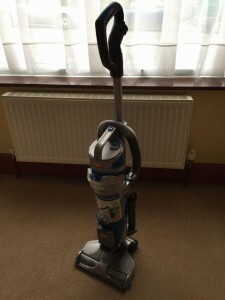 The flexibility of being cordless means I can do the stairs when they need doing and somehow not having to unwind the lead, plug it in, clean then reverse to put it away has meant that hoovering is no longer a task I dread. This post is not a review of this particular machine but just a shout out for upright cleaners especially if you have a stiff back or really dislike that aspect of cleaning. What sort of cleaner do you prefer and why? Would you change? Dislike vacuuming, which is why I have only one room with carpeting! My husband buys our vacuums, and I’ve never liked or disliked one more than another! Good post though–glad you like your new one! If he buys the machines, does he do the vacuuming? My husband hates it! I use the old school method broom and mop. I don’t have carpet due to my high allergies. That doesn’t sound like fun on either case Sacha! My GP told me years ago not to use a cylinder hoover as its the worst thing you can do with a bad back! Should have made an appointment with that doctor! I have owned three vacuum cleaners. The first was a second hand upright with lots of attachments that i worked into the ground. finally, it left more on the carpet than it picked up, and I replaced it with an AEG highly recommended by Which? Magazine. The AEG was a cylinder nad served me well for twenty or more years. Now I have a Henry; squat, solid and reliable. But I know what you mean about the user friendliness of uprights, and though they take up more space (an issue in my small flat) I think that if Henry ever dies I shall try to find room for one. This new one is not are space taking as my previous one. Horses for courses I suppose! I have a little one that vacuum that runs while I work. I still use my upright for tough spots, but not nearly as often. They seem to be making them smaller these days Trenna!